The main academic activity of Ecole Centrale de Nantes (ECN) is to train engineers for industry (three years of training with a level of master 2 for graduates). The training consists of high-level scientific and technical teaching. Ecole Centrale de Nantes has a total of 2150 students including 500 Masters or PhD students and 250 continuous training students. It holds agreements with more than 240 international universities. The research and teaching staff counts 150 persons. ECN is one of the five general engineering schools of the Ecoles Centrales Group (Paris, Lyon, Lille, Marseille and Nantes). This group has gained an international recognition with more than 1800 engineers graduated every year and more than 2000 researchers. ECN expertise is focused on free surface hydrodynamics for marine renewable energy systems. This includes wave resource assessment and modelling of the interactions between wave and marine structures through the use of experimental and numerical approaches. 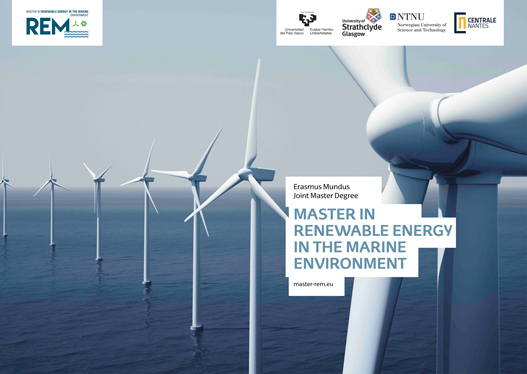 The practical application to the design and the optimization of marine renewable energy systems is a field in which ECN has a long experience in both teaching and researching. The unique academic large scale facilities available at ECN: a towing tank (150m long) and a large ocean wave basin (50m length, 30m width and 5m depth with a multiflap wavemaker able to generate complex multidirectional waves) will contribute to the teaching programme of the master. These experimental facilities will also possibly host students for their master’s thesis.